Add this vanity to your bathroom for more modern style in your home. Its beautiful white acrylic counter and off-white mdf base bring a great new look into your bathroom. Its drawers and roomy double-door cabinet are great to keep bathroom items in. This classic set from Cutler Kitchen Bath will make your bathroom look brand new. Meadows Cove 30-inch W 2-Drawer 1-Door Freestanding Vanity in Off-White With Acrylic Top in White This vanity is a great way to add modern style to your bathroom. With a white acrylic counter and off-white mdf base, this product is good-looking and useful. Made with a roomy single-door cabinet and drawers, this vanity has lots of room to keep items like toothpaste, towels, and hair brushes. Redo the style of your bathroom with this classic from Cutler Kitchen Bath. Meadows Cove 30-inch W 2-Drawer 1-Door Freestanding Vanity in Off-White With Acrylic Top in White is rated 4.0 out of 5 by 1. Rated 4 out of 5 by Pragmatica from Nice functional and roomy vanity. 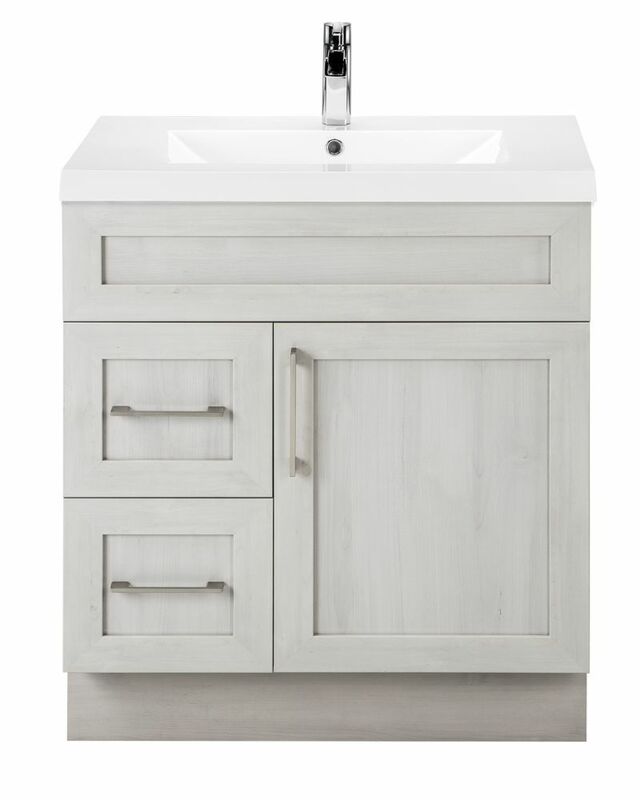 This is a lovely looking and solidly built, made-in-Canada vanity with soft-close doors and hefty, nice looking brushed nickel handles. The MDF (medium density fibreboard) material it's made out of is CARB2 certified, so it doesn't stink or off-gas toxic formaldehyde. The very pale grey finish of this Meadows Cove version has a faint wood grain appearance to it. We purchased the left-hand version (drawers on the left) because we were worried the door would not open, since the left side of the vanity abuts a wall completely flush in our particular bathroom. It turns out the door hinges actually make the large door open in a manner that doesn't project further beyond the side of the cabinet anyway, so either version would have worked in our case. The only con we've found is the sink itself, while nice and contemporary looking, is quite shallow, so it's easy to splash water up onto the sides and back. You need to hold your hands low near the bottom of the sink, and be careful not to splash. The door is maybe a millimeter or two out of alignment with the top drawer, but it's not noticeable unless you're looking very closely. This vanity looks very nice paired with a Pfister Ladera single lever transitional faucet that we bought at the same time. Overall, we're very happy with our purchase. It's a good, solid vanity without breaking the bank and spending thousands.